I'll let you in on a little secret: I'm part of the US Army. A proud solder, in fact. As a solider, we love to get down and dirty as we put in many long, tough hours. I vividly remember going through Basic and AIT, dragging myself through the mud - and what was I focused on? Food. On the days we received a dish we really loved, it acted as a significant morale booster. The morale booster I remember the most was a delicious, flavorful chicken cordon blue. When I knew this was on the menu, it really seemed to make the day simply disappear. Needless to say, a chicken cordon blue recipe means a lot to me. Butterfly each chicken breast. Season with salt and pepper. Wrap 2 pieces of ham around each piece of cheese. 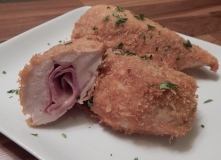 Place ham-wrapped cheese in the center of each chicken breast. Fold the chicken breasts around the ham. Place the stuffed chicken breasts in a large zipper lock or vacuum seal bag. Seal the bag using the water immersion technique or a vacuum sealer on the dry setting. Place in the water bath and set the timer for 1 1/2 hours. About 15 before the chicken is finished, begin heating the oil for frying: Pour about 2 inches of oil into a large Dutch oven. Heat the oil to 375ºF over medium-high heat. Place the flour, heavy cream, and panko each in their own shallow bowl. Season the flour with salt and pepper. When the timer goes off, remove the bag from the water bath. Remove the stuffed chicken breasts from the bag and pat very dry with paper towels. Dust the chicken with the flour and then dip it into the heavy cream. Place the chicken to the panko and roll to coat. Carefully transfer the chicken to the hot oil and fry until golden brown, 2 to 3 minutes. Let drain on a paper towel-lined plate for 1 minute and serve, garnished with parsley.